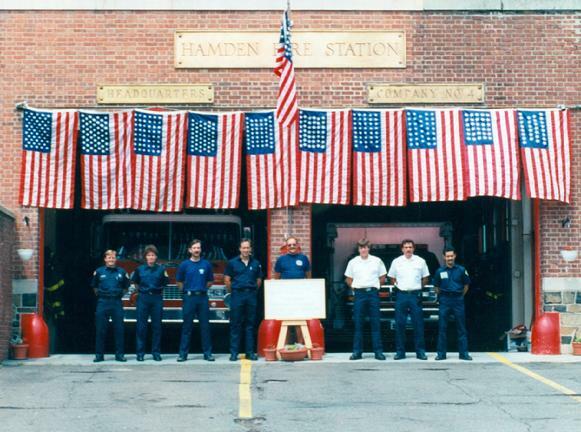 June-July 1996 - In observance of the 220th anniversary of our country and the 210th anniversary of the Town of Hamden, historic flags flew at Station 4 from Flag Day until July 4th. All of the flags were new, purchased by two department members through retail establishments. Any authentic U.S. flag design from the past, regardless of the number of stars, is considered an official U.S. flag and may be flown as such. Each day from June 14th until July 4th 1996, a U.S. flag with a different number of stars flew from Station 4's flag pole. An informational card was displayed on an easel in front of the station, providing details about the number of stars and the dates of service. This display of historic American flags was in strict compliance with the U.S. Flag Code. Department members went to great lengths to ensure that the flags above the bay doors was properly anchored. However, the multi-flag display was taken down after about a week when concerns that Engine 4's exit and re-entry might cause damage to the flags flying above it. A different historic U.S. flag continued to be flown each day from Station 4's flagpole until July 4, 1996. CLICK HERE for a July 2010 New Haven Register YouTube presentation, "Happy Birthday, Old Glory," featuring two HFRA members talking about the history of the U.S. Flag. The flagpole above the doors at Station 4 is a fairly new addition. Until March 1995, the flagpole on the front lawn of the town hall also served Station 4. The firefighter on first watch hoisted the flag right after 0800 roll call and the last man on watch took it down. When former Hamden Deputy Fire Chief Walter Macdowall passed away suddenly in March 1995, he was then serving as the Chief of the LaGrange, Illinois Fire Department. Representatives from LaGrange and members of the Hamden Fire Department turned out en masse to pay their respects. In preparation for Chief Macdowall's funeral procession, which was due to pass by the town hall and Station 4, Hamden firefighters lowered the flag in front of the town hall to half-staff. In an appalling affront to the LaGrange and Hamden firefighters, a town hall maintenance employee raised the flag to full staff before the procession passed, stating that he was ordered to do so by the mayor. From that day forward, Hamden firefighters left the duty of hoisting the town hall's US flag to town hall employees, and installed their own flagpole above the doors at Station 4 shortly thereafter. Only the President of the United States, a state governor, or the Mayor of the District of Columbia may order a US flag to half-staff. But the U.S. Flag Code and Federal laws do not constrain organizations and individuals from lowering their own flags to half-staff when it is deemed appropriate to do so. In 234 years, our national flag has had twenty-seven different official designs! Since the early 19th century, whenever a new state (or states) joined the Union, the appropriate number of new stars was added to our flag the following July 4th. On Sunday, July 4th, 2010, the 50-star flag will be fifty years old. For the past three years it has been the longest serving current flag design in our nation's history. Note the phrase "current flag design," because all of the previous twenty-six official designs are also considered official US flags and may be flown as such at any time. The 48-star flag, adopted July 4, 1912 following the admission of New Mexico and Arizona, served as the current U.S. flag during World War I, World War II and the Korean War. Until three years ago, the 48-star flag design had served the longest - forty-seven years. Alaska was admitted to the Union on January 3, 1959, requiring that a new star be added to our flag the following July 4th. But would it be one star, or two? The Territory of Hawaii was also in the process of achieving statehood. If Hawaii were admitted before July 4, 1959, the new flag would have 50 stars. But Hawaii didn't achieve statehood until August 21st, thus missing the opportunity to put a 50th star on the U.S. flag that year. For the next year the new U.S. flag had 49 stars. With seven staggered rows of seven stars each, the 49-star US flag debuted on July 4, 1959. Just like several other earlier official US flags, the 49-star design would be short-lived. The following year, on July 4, 1960, the 50-star U.S. flag was adopted. It has been our nation's official flag design ever since. In the event a new state is admitted - some suggest that Washington, D.C. and Puerto Rico are solid candidates - officials have already designed 51, 52, 53 and 54-star flags. But the 50-star flag is not likely to be replaced any time soon. TRIVIA QUESTION: During the past fifty years, the 50-star flag has covered the caskets of nine U.S. presidents. John F. Kennedy was the earliest (1963) and Gerald Ford was the most recent (2007). Most folks can name at least six more. But can you name seven? If you can, you're really good. SCROLL TO THE BOTTOM OF THIS PAGE FOR THE CORRECT ANSWERS. For US flag manufacturers, 1890 was to be a banner year (no pun intended). North Dakota, South Dakota, Montana and Washington were all admitted to the Union in November 1889. As Independence Day 1890 approached, flag manufacturers began cranking out tens of thousands of new 42-star flags, which would become the newest official flag on July 4, 1890. One can only imagine the panic that must have gripped the flag factories when Idaho was admitted to the Union on July 3, 1890. Those thousands of 42-star flags would never become official. At the last minute, an awkward looking 43-star design was implemented, with an extra star tacked onto the top row. The 43-star design remained the current flag for only one year, when a 44-star flag was introduced to recognize the admission of Wyoming. Original examples of the non-official 42-star flag still exist, and are said to be quite valuable. Some folks will wince when viewing this pre-World War I photo of a 45-star flag being used as a table cloth. However, we're sure that these earliest members of the Whitneyville Fire Association meant no offense or disrespect to Old Glory. This photo was taken decades before the adoption of the U.S. Flag Code, which now forbids many kinds of flag displays which had been previously quite common, including parading the flag flat, using the flag as a bunting, or hanging the flag as a ceiling covering. One of the most common Flag Code violations today is using the flag itself as wearing apparel or a head scarf, which is not the same as reproducing the flag image on apparel. Sleeping Giant during Hamden's Centennial Celebration the week of June 15, 1886. 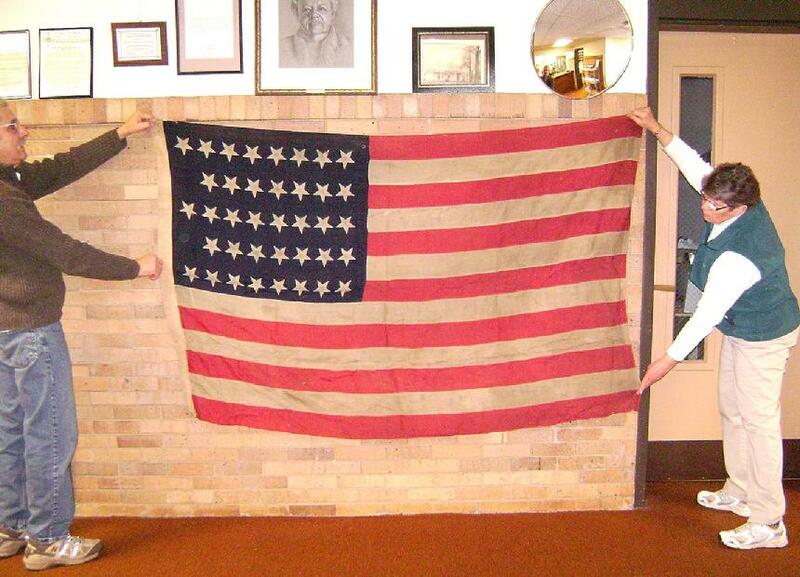 This photo, taken in the Al Gorman History Room at Miller Library four years ago, shows then-archivist Joe Pepe (left) and history room volunteer Kathy Gee displaying the entire flag for the photographer. The Al Gorman History Room is located on the top floor of Miller Library, 2101 Dixwell Avenue, in that part of the building that was once Centerville School. It is open to the public every Tuesday from 10 a.m. until 2 p.m. The public is always welcome. The room is closed during the months of July and August, and opens again the day after Labor Day. But there are still three more Tuesdays before it closes for the summer. Visiting the room is a rewarding experience for anyone interested in Hamden history. ANSWERS TO THE FLAG TRIVIA QUESTION ABOVE: The 50-star flag, inaugurated on July 4, 1960, draped the caskets of the following presidents of the United States: John F. Kennedy (1963), Herbert C. Hoover (1964), Dwight D. Eisenhower (1969), Harry S Truman (1972), Lyndon B. Johnson (1973), Zachary Taylor* (1991), Richard M. Nixon (1994), Ronald Reagan (2004), and Gerald R. Ford (2006-7). *Zachary Taylor, the 12th President of the United States, was elected in 1848. He died suddenly on July 9, 1850 of what appeared to be an acute gastric ailment. Given the signs and symptoms of his sudden illness that were reported at the time of President Taylor's death, some 20th century historians believed that he could have been poisoned. If that were the case, it would have enormous historic implications. Who did it? And why? And history books would have to be rewritten to acknowledge that he was the first assassinated president. In 1991, President Taylor's descendants consented to have his body exhumed and tested for arsenic poisoning, which proved negative. Taylor's body was transported in a modern Cadillac hearse, making Taylor the earliest serving president whose body was so transported, and his casket was draped with a contemporary 50-star flag.